In 1846 Ramasamy Mudalaiyar started a coffee plantation in Valparai for the first time. In 1864, Karnatic Coffee Company started their plantation as well but after a few years they sold their lands due to unprofitable business. In 1875, roads and Colonial guest houses were built here anticipating the impending visit of England’s Prince of Wales (which was later canceled). In 1890, W. Wintil and Nordan brought huge tracts of land in Valparai from the Madras State Government which was under the control of British Raj and cleared the space for tea plantation. 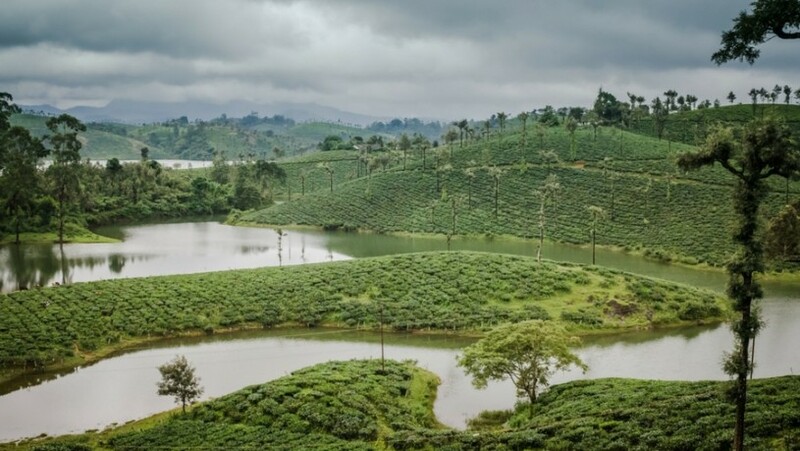 Since then Valparai has been home to many tea plantations and its rich flora and fauna makes it a popular weekend destination for city dwellers. Valparai enjoys a moderate climate during the summer months and the best time to visit the place is from October to March. Monsoon season begins from June to August in Valparai where you can enjoy some steaming hot tea fresh from the plantation. Most often travelers avoid the monsoon season here, as Valparai receives the highest rainfall in the region. The nearest Train station is at Coimbatore which is around 105 Km away from Valparai. A popular destination for tourists, Pollachi is famous for its pleasant temperate climate and lush terrace gardens. It also has the distinction of being the most favored destination for the film industry to shoot movie songs. Pollachi is also famous for its vegetables, tender coconuts and Jaggery so you should check out the local markets while you are here. One of the most popular temple destinations in South India, Palani Hills is the most important abode of Lord Muruga (Son of Shiva and God of War). Palani Hills lies in the east of the Western Ghats and runs parallel to the West Coast of India. One of the must-see temples in Palani is the Palani Temple where Lord Muruga stands as Dandayudhapani (the one with the staff) and blesses his devotees. Built in 9th century AD, Palani Temple devotes can climb 693 steps or travel via the Winch or Rope Way System. There are many other temples of interest in and around Palani Hills namely – Tiru Avinankudi, Kannadi Perumal Temple, Idumban Temple etc. Popularly known as Kovai, Coimbatore is the second largest city in Tamil Nadu next to Chennai. Situated on the banks of Noyyal River and surrounded by Western Ghats Coimbatore is also a historical city ruled by Cheras and Nayaks in the medieval period. 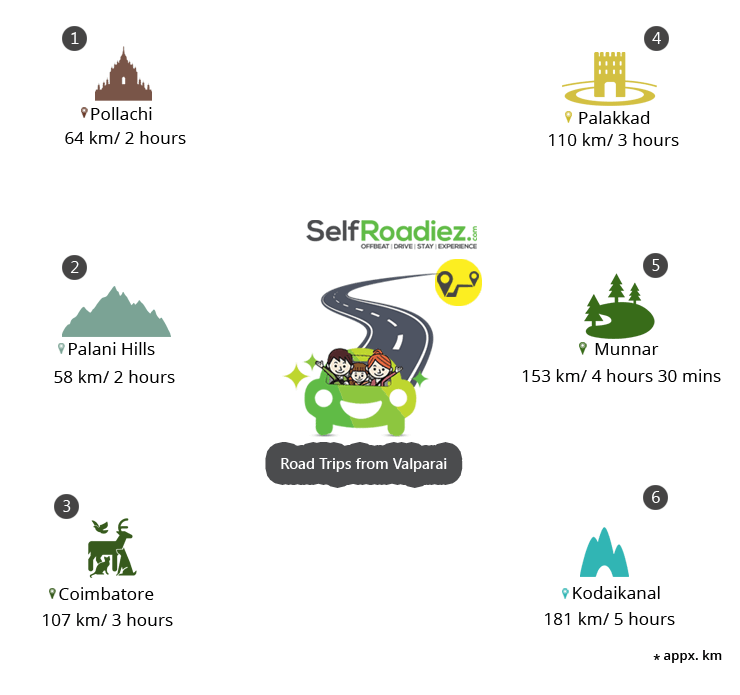 There are many things to see and experience while on a day’s trip to Coimbatore. One can visit popular temples such as Dhyanalinga Temple, Marudamalai Temple, Arulmigu Pateeswara Temple, Eachanari Vinayaga Temple etc. Kovai Kutralam falls is yet another place that can’t be missed while in Coimbatore. Those who are traveling with kids might want to visit Black Thunder Theme Park – a unique water game park. A lush hill station located in Idukki district of Kerala, Munnar is 1600 meters above sea level in the Western Ghat Mountain region. Munnar is named after the confluence of three rivers that flows down here – Mudhirapuzha, Nallathanni, and Kundaly. A beautiful hill station Munnar has many protected National Park reserves – Chinnar Wildlife Sanctuary, Manjampatti Valley, Indira Gandhi National Park, Eravikulam National Park, Anamudi Shola National Park, and Pampadum Shola National Park. A lovely place to drive around, this would be a memorable road trip for your family. One of the most popular tourist destinations in South India, Kodaikanal literally means ‘The gift of the forest’. Situated at 7200 feet above sea level this hill station is the most picturesque place in all of Western Ghats. Spectacular waterfalls, scenic picnic spots, misty mountains, and a pristine city – Kodaikanal is a place that can be visited again and again. There are many spots of interest that one can visit in and around Valparai – Aaliyar Dam, Sholayar Dam, Chinnakallar Waterfalls, Annamalai Wildlife Sanctuary, Monkey Falls, Loam’s View Point, Tiger Valley etc. There are many temples around Valparai that are worth a visit – Balaji Temple, Chitti Vinayagar Temple etc. Grass Hills is yet another place that ought to be visited while in Valparai. A part of Indira Gandhi Wildlife Sanctuary Park, Grass Hills is a beautiful site filled with lush green grass and many picturesque spots to lounge around. There are many guest houses, hotels, tea estate bungalows in Valparai to stay. Homestays and Bed & Breakfast are also available here for those who are looking for budget accommodation. The estate that houses this Bungalow has sprawling acres of tea plantations. The area falls under a protected zone, the lush greenery here is largely protected with only the minimum required buildings coming up making it a fantastic getaway from the hustle-bustle of city life. The six large bedrooms in Scenic Hill Station Bungalow reflect the taste of the colonial era with antique-style bay windows. The rooms are also fitted with modern amenities for a luxurious stay. A serene and relaxed ambiance with a run around balconies provides the perfect view of the surrounding scenic beauty. The uniqueness of this bungalow is that it offers a stay in tents, all under the green canopy of huge trees. The four tents are well-equipped and also quite large, having a space of 220 sqft each, all with attached bathrooms. A large compound makes it possible to ensure that each tent is equally private. A dining room is available for the convenience of guests staying in the tents. While staying in a tent you can also seek pleasure in wildlife photography, long strolls, and cycling. The tent areas have facilities for campfires with access to a large barbeque pit, making the stay here fun. The property houses four wooden chalets, each looking out to the panoramic wooded areas, and each of these is excellent spots for bird watching enthusiasts. Valparai is one of those few places in South India where Nature can be seen at its best from 3,500 feet above the sea level on the famous Annamalai mountain range. The cool mountain breeze and the lush verdant green forests promise a glimpse of the wild that is not only beautiful but also adventurous. A visit to the coffee plantation is a must here and one can’t leave the place without a sip of their hot coffee.